On Monday night, Todd and I attended the funeral of expat and friend, Ed Blizzard. Ed died early Sunday morning after a brief and brave battle with cancer. Ed and his wife Linda are expats from Minnesota who have lived here for several years. Loving and kind and generous – both the nicest people you could hope to meet. Ed was well respected around here; he had a great sense of humor and was a man of enormous faith. He was a beloved family man, and a friend to all. 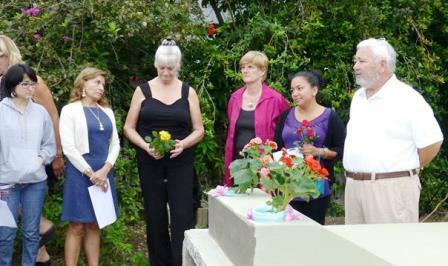 Ed’s celebration of life ceremony started at 5PM, graciously hosted in the home of expats Myron and Susan McCumber. There was a large turn-out – at least half were Ecuadorians. It was a special evening, and a telling testimony to Ed’s life to observe the camaraderie between all in honor of Ed as we gathered and chatted. Eventually, there was a lovely procession to the nearby picturesque San Jose cemetery (which overlooks the ocean) and moving eulogy given by Shel Spivey, with Erika Klein interpreting. Several others spoke as well. 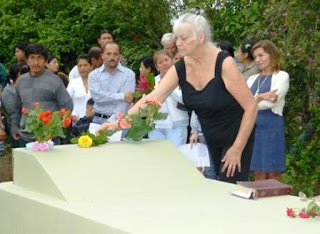 It was a ceremony that incorporated both gringo and Ecuadorian traditions, and at the very end, we sang “Amazing Grace” around Ed’s burial site. I don’t think there was a dry eye in the house. 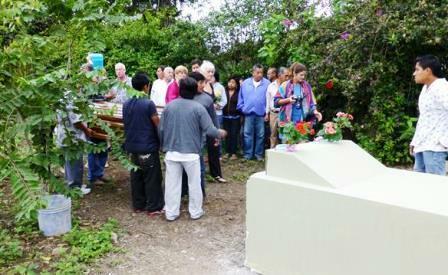 Afterwards, we returned to the house, where we shared a pot-luck and fond remembrances of Ed. His grandchildren had compiled a sweet and poignant picture presentation playing on several computers, which included music, personal memories, and inspirational Bible verses from each. It was an extraordinary evening for an extraordinary man. “In my Father’s house are many dwelling places; if it were not so, I would have told you; for I go to prepare a place for you. And if I go and prepare a place for you, I will come again, and receive you to myself; that where I am, there you may be also. * My thanks to Colleen Geis (Baker) who provided most all the pictures for this post. The top/first photo of Ed and Linda was taken in October of last year. Others also got some special photos, and I may be posting more as received.